On January 29, 1993, former Los Angeles Mayor Tom Bradley stood among a swarm of public officials and transit agency staffers on the cramped Pershing Square subway platform. Standing shoulders above everyone else, including then-California Gov. Pete Wilson, Bradley proudly inaugurated the opening of the first modern subway in Los Angeles. Today, Metro marks the 20th anniversary of the Metro Red Line’s first phase from Union Station to MacArthur Park, a nearly 4.5-mile construction milestone that began a brand new chapter in regional rail construction and placing L.A. among other major cities across the globe with high-speed, high-capacity subways. Few may remember how historic the opening of the first subway segment really was. It was designed from the outset to be the backbone of a new regional rail network. Its arrival helped mark a return to the halcyon days of rail that began in 1990 with the opening of the L.A.-to-Long Beach Blue Line. Prior to that, there were no local or dedicated rail lines serving urban Los Angeles commuters following the dismantling of the last Red Cars in the early 1960s — whereas, for example, BART service in the Bay Area began in late 1972. The subway put transit back on the map in L.A., and was both an engineering marvel and mammoth undertaking. In order to build a first-phase station terminus at Westlake/MacArthur Park, construction crews had to completely drain the eight-acre MacArthur Park Lake to build twin subway tunnels and a “pocket track” to store subway cars. After construction, the lake had to be refilled with 20 million gallons of water that required seven days to fill. Construction crews restored and beautified the entire park and added a fountain, trees, benches and lighting before work at the site was complete. Overall, the subway’s construction spurred L.A.’s economy by generating at least 100,000 direct and indirect jobs, turbocharged Metro ridership by bringing more people into the system and began the transformation of the neighborhoods above it. Most stations have major investments follow. New mixed-use developments, including affordable housing and retail opportunities emerged to offer more people a “transit-friendly” lifestyle. The obvious beneficiary from the first phase of construction work was downtown Los Angeles. By the early ’90s, the area was known strictly as a day-time work destination that one avoided at night. The subway — and later Disney Hall and Staples Center at either end of downtown — created the impetus for a “live, work and play” ethos that continues to draw new residents, cultural venues and entertainment centers to invest in downtown. And then there was Hollywood Boulevard, which was notoriously blighted in the early 1990s. The subway would arrive in Hollywood in the late 1990s, help igniting a still-underway revitalization as a result of the three subway stops there. And in North Hollywood, the arrival of the subway lent vitality to the entire NoHo Arts District, spurring new residential, commercial and retail establishments — and with even more development planned. At 20, it’s safe to say the Red Line has only reached its adolescence, yet it is still the youngest subway system on the American continent. The only subway system that is younger is the one in Puerto Rico, which opened in 2004. About 4.5 miles long, the first subway segment traveled underneath prime downtown property at a depth of 70 to 80 feet between L.A. Union Station and Westlake/MacArthur Park, making stops at the Civic Center, Pershing Square, and 7th Street/Metro Center. The promotional fare was 25 cents when it opened. Understandably for a line of its short length, ridership was slow growing at first. The new Line, with its Italian-built trains, started out as basically a lunch-time shuttle for downtown workers and people connecting with Metrolink, the new county-to-county commuter rail system that opened the previous year in 1992. At a cost of $1.431 billion for the initial segment, a project of this magnitude required a hefty contribution from the federal government. Uncle Sam ponied up 48 percent of the cost, with the remaining 52 percent coming from local and state sources. One of those sources, the Prop A half-cent sales tax increase, was approved by Los Angeles County voters in 1980 and provided the project with a life-saving local funding match. Construction crews broke ground on September 29, 1986. During construction, crews discovered artifacts, including porcelain plates and opium bottles from the original Chinatown underneath Union Station. Some of these found items are embedded in an artwork called “City of Dreams, River of History” by artist May Sun at Union Station’s East Portal. Workers also found the oldest and most diverse collection of fossils ever reported from the L.A. Basin’s Miocene period — with some dating back 15.5 million years. Construction, of course, had its challenges. There was a tunnel fire during construction of the first segment near Union station. Construction crews ran into some infrastructure on Broadway that was not on utility maps. Old fuel oil tanks used to heat buildings in the early 1900s were also found and had to be delicately removed and/or emptied of fuel before proceeding with tunnel boring machines. The line had its first earthquake test in early 1994 when the Northridge quake hit the San Fernando Valley on January 17. Inspectors made a thorough investigation of subway tunnels and found no damage. Subway trains resumed service the next day. Following the subway’s opening to Westlake/MacArthur Park in 1993, consecutive construction phases brought the line to Wilshire/ Western in 1996, Hollywood in 1999 and North Hollywood in 2000. The total cost to build the entire 17-plus mile subway from downtown L.A. to North Hollywood came in at $4.5 billion. Ridership conveys the most compelling story of the line’s continued growth. In its first official month of service, the first phase of the subway carried 16,350 riders on the average weekday. As of December 2012, the Red and Purple Line subway carried an average of 158,830 riders per weekday. In the 2012 Fiscal Year, the line carried nearly 48 million riders. One of the peculiarities of the subway is that even today many residents in parts of the county have never used it or do not know it exists. However, that is likely to change as the subway moves from adolescence to maturity with the extension of the Metro Purple Line to the jobs-rich Westside. This new subway construction effort will be funded in part by Measure R, the sales tax increase passed by 68 percent of voters in 2008 — the key to launching a project that otherwise lacked funding. And, as with the first leg of the subway, Metro is finalizing a funding agreement with the federal government to pay for some of the extension. 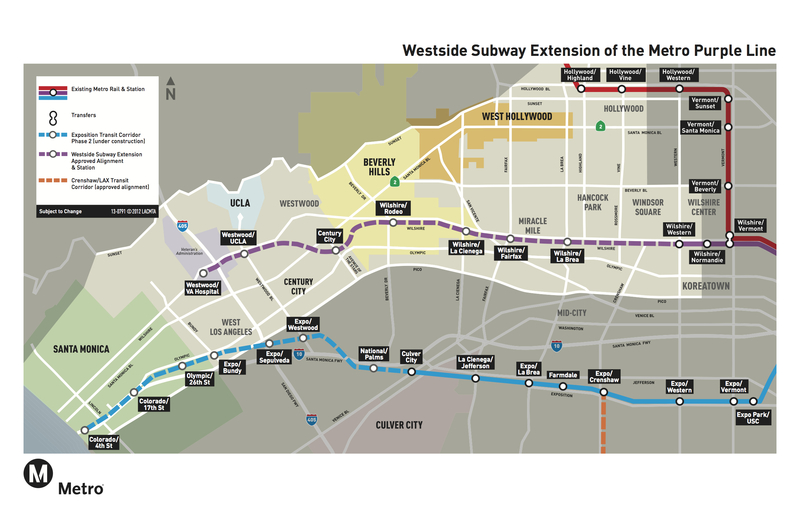 The new subway will continue where the subway left off at Wilshire/Western in 1996 and will travel for nearly nine miles — mostly under Wilshire, with a swing south to Century City — and be the second rail line to reach the Westside. The first is the Expo Line, which opened to Culver City last summer and is targeted to open to Santa Monica in 2016. The irony: The Expo Line was planned as the sole rail line to the Westside at a time when the Westside Subway seemed to be a dead project. Again, the subway’s construction will be phased — the first phase to La Cienega is estimated to open in 2023 — so history will repeat itself as L.A.’s subway continues segment by segment to reach a new generation of Angelenos and new parts of the county in coming years. Under the current long-range plan, trains should reach Westwood/VA in 2036 unless Metro finds a way to fund an acceleration of the project. @Brian: I know I’m on the losing side of this, but I wish we built for the daily commute. We should build to the airports…eventually. But we have too many Monday-Friday interstate parking lots to spend billions on airport connectors that will serve less people than bus lines. It would have been nice for the Redline to have gone west to the 405, then south to Westwood where it would turn into the purple Line. A loop through the most congested and heavily populated areas in our County. Valley buses could have fed the train to downtown and westside job centers decreasing travel times, reducing pollution, and increasing private investment. Sending the redline to Burbank Airport would be a major waste, but Trains and Planes make headlines, no matter how low the ridership is. I dont think your on a losing side. The fact is, Los Angeles highways are a mess, and there needs to be a better way of moving people around the metro area. If we could rewind back to the planning phase, I’d agree with you …but the Red Line is already in North Hollywood, not far from Burbank Airport. My thinking there, that connection could give reason to move some domestic flights from LAX; have them go to Burbank and alleviate some of that traffic. Now, the Purple line has the option to go through Westwood, and maybe north along 405 to Van Nuys. The problem today is that the notion of the Green line directly serving LAX is that because it is LRT, its capacity is limited and the rail cars are too small with no place to put even a modest bag or two. Heavy rail is needed to directly serve LAX. However, extending Green line a few miles east to connect to Norwalk Metrolink is often forgotten, and a better investment and use of limited capacity LRT than over saturated Green line cars becoming an unattractive alternative to get to LAX than by automobile. While we’re on the topic of rail-airport connections, let’s not forget about Long Beach Airport! The Green/Expo Line (other end) is already going to be extended along rights-of-way in Redondo Beach. How about extending it farther — by the 405 to Long Beach Airport, with a transfer point at the Blue Line’s Wardlow station? @Mike: I would Love it if the Green Line was extended to Long Beach Airport. Right now, I talk the 111 Long Beach Transit but down to the Transit Mall, just to double-back up on the Blue Line into Downtown LA. (I take that route so I can at least get a seat on the Blue Line). LA is getting better tho; slowly but it’s getting better. Heavy rail would be great, but it is also very expensive, especially when LRT can be running at grade, and it will be tough enough already to get funding for LRT. Metro should plan for LRT with increase service and longer length trains. I like AD’s notion of a big commuting loop through the heart of metro LA. And I think that, given the spread-out nature of the Valley, a subway down the middle of the 101 with park and ride stations could actually work. Urbanist-wise, a Ventura Blvd. tunnel alignment would be preferable, but also considerably more expensive I would add a mini interior 1/2 loop to that – a line going down Santa Monica Blvd., up to the Sunset Strip and then down to connect to the Purple line on La Cienega. I dont agree with the redline going to ucla 🙁 and can the blue line have a stop at santa monica college?? Everyone wants a train that gets them one ride to anywhere and we all want it done fast, not tomorrow, but today, pronto at the snap of the finger. We all say this because we want a $1.50 ride from the front step of our home to anywhere in the city. I’m sorry to put reality into people’s faces but it’s not going to happen. There is no way we can have a single $1.50 ride, no matter how short or far it is, or have one ride to get there. If you’re lucky, you may get a 20 mile single ride for a $1.50. If you’re unlucky, you may get a $3.00 ride for a 5 mile ride across two buses or trains. That’s how the screwed up fare system works in LA. And no, change is not going to happen overnight either. We’re not going to wake up tomorrow and see a transit oriented city where people don’t need cars to get around. LA and California is broke. And we keep electing local politicians who simply do not care about balancing the budget or properly using our tax dollars. Their primary motive is to use our tax dollars and do wasteful spending to make them look good so they keep getting re-elected. Public transit in America doesn’t make any money either because we too dumb to figure out how it can be profitable. We have yet to figure out what other cities around the world are doing right to achieve over 100% from the farebox and actually churn a profit while we have a pitiful farebox recovery ratio of less than 30% and continually beg for more loans, grants, and come back crying to taxpayers for more money. Since it’s not profitable so it’ll always be dependent on taxes. And people do not want higher taxes. We don’t want cuts in services either. We don’t want fare hikes either. @LAX frequent flyer: name some other public transit lines elsewhere in the world that make an operational profit and that are not in Hong Kong.